EVERETT — Construction of 65 affordable housing units kicked off with a ceremony Monday. City, county and state officials, community leaders and other guests celebrated the start of HopeWorks Station II in an afternoon groundbreaking. Everett Mayor Cassie Franklin was one of the featured speakers. So was a man who once was homeless but went through and graduated from the HopeWorks training program to now own a home. The building along Broadway will offer housing and a training and a workforce development center. The total project is expected to cost just under $30 million and is funded by 13 different sources, including grants from the city of Everett, Snohomish County, Washington state, tax credits, and loans from social investors. It was developed in collaboration between Housing Hope and its affiliated HopeWorks Social Enterprises, five years in the making. 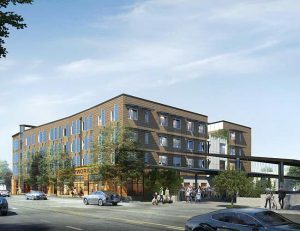 This afternoon Housing Hope broke ground on HopeWorks Station II, a 67,000 square foot high-rise structure that will redefine Broadway Avenue and transform the Everett Transit District. 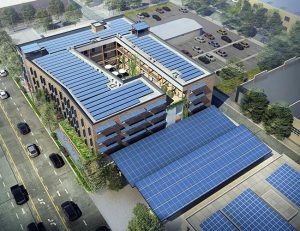 HopeWorks Station II is a multifaceted initiative that will feature 65 supportive housing units for vulnerable populations, as well as social enterprises. Federal and state tax dollars fund the project as well as private donors. The building will take 14 months to complete.